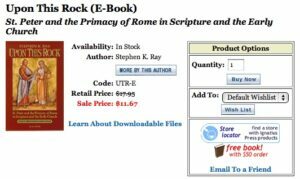 I was happy to see that my book Upon this Rock: Peter and the Primacy of Rome in Scripture and the Early Church is now being sold as an e-book through Ignatius Press. It is also sold at a big discount because it doesn’t have to be published with paper and ink. I think I was the first to buy one so I can have it for reference on my laptop and iPhone. How cool! To buy this in book form or to read reviews, debates about it, excerpts, audio, etc, click here.